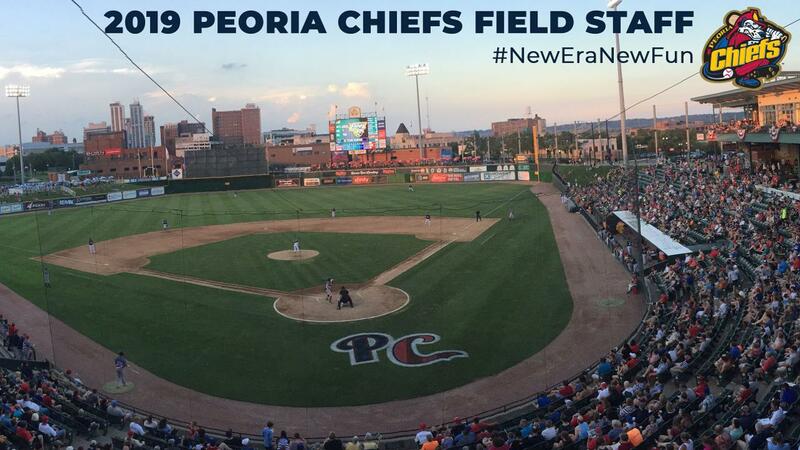 PEORIA, IL - The Peoria Chiefs and St. Louis Cardinals have announced the 2019 Chiefs field staff with former Major Leaguer Erick Almonte named manager. Pitching coach Cale Johnson and hitting coach Russell Chambliss both return to Peoria after helping the Chiefs to the MWL Championship Series last year. Athletic Trainer Chris Walsh and Strength & Conditioning Coach Kyle Richter are both newcomers to the Chiefs staff. Almonte, who turns 41 in February, will manage the Chiefs in 2019 as the 24th manager in team history and the fourth manager in the seven years of the second Cardinals affiliation. A native of Santo Domingo, Dominican Republic, Almonte is the first manager in Chiefs history to be born outside the United States, and the 14th to have played in the Majors. He managed last year with the GCL Cardinals going 40-16 with a loss in the Gulf Coast League Championship Series. In 2017 he served as the hitting coach for High-A Palm Beach under former Chiefs skipper Dann Bilardello. The 2017 Palm Beach team was declared Co-Champions of the Florida State League after Hurricane Irma ended the season prematurely. Almonte was a coach for the Dominican Summer League Cardinals from 2014-16. Almonte was the first player ever placed on the MLB concussion-based 7-day disabled list, on April 26, 2011 and he never played in another MLB game. Coincidentally, both of his MLB home runs came on April 2, eight years apart. He homered April 2, 2003 in Toronto off Pete Walker and then for Milwaukee on April 2, 2011 in Cincinnati off Travis Wood. His brother Hector pitched in the Majors in 1999 and 2003 for the Florida Marlins, Boston Red Sox and Montreal Expos. Johnson, 31, returns to the Chiefs for his second season as a coach in the Midwest League and his fifth overall with the Cardinals organization. Last season the Chiefs finished 8th in the MWL in ERA while racking up the second most strikeouts in franchise history. Before joining the Chiefs last year, Johnson was the pitching coach for the Appalachian League's Johnson City Cardinals for two years. The 2016 Appy League Champions led the league in team ERA (2.53). Prior to joining Johnson City, Johnson was the Gulf Coast League Cardinals pitching coach in 2015 and the team finished with three individual pitchers in the top 10 in ERA and strikeouts. Johnson played in the Cardinals system with a 2011 stint for the Quad Cities River Bandits. A 41st round pick by the Cardinals in 2009, Johnson went 8-9 with a 3.81 ERA in 55 career games, 15 of those as starts. He pitched for the GCL Cardinals and Johnson City in 2009 going a combined 2-1 with a 3.44 ERA. Johnson spent all of 2010 with Johnson City going 5-4 with a 3.61 ERA in 13 games with 10 starts and 36 strikeouts in 62 1/3 innings. In 2011 he was part of the MWL Champion River Bandits squad that included Carlos Martinez, Trevor Rosenthal, Kolten Wong and the late Oscar Taveras. Johnson pitched in 30 games that season going 1-4 with a 4.33 ERA over 52 innings. A native of Greeneville, IL, Johnson was the 2008 and 2009 American Midwest Conference Pitcher of the Year at McKendree College in Lebanon, IL. He fired 24 career complete games for the Bearcats and went 21-7 over his final three seasons. Chambliss, 43, is in his second season as a coach in the Cardinals organization as he returns to Peoria. Last year's Chiefs offense finished second in the MWL in batting average, third in OBP, fifth in home runs, fourth in doubles and third in hits. Chambliss helped then-teenager Elehuris Montero to the MWL batting title and the third baseman also led the league in slugging percentage while Yariel Gonzalez finished third in batting average. Chambliss has college coaching experience with the SUNY-Maritime Privateers where he was an assistant coach from 2014-2015. Prior to joining the college ranks he coached Paramus Catholic High School in Paramus, NJ while also teaching hitting and fielding clinics in the Bergen County area. He played in the New York Yankees organization from 1997-1999 with 63 games at the Single-A or Advanced-A level. Chambliss played two seasons in Independent Leagues before retiring from baseball after the 2000 season. A left-handed hitter, Chambliss played at Tucker High School in Glen Allen, Virginia before playing for both Washington & Jefferson College (PA) and Washington University in St. Louis. He was drafted by the San Diego Padres in the 64th round of the 1993 draft out of high school and then by the Yankees in the 52nd round of the 1996 draft and the 54th round of the 1997 draft. His father Chris played in the Major Leagues from 1971-1988 with the Cleveland Indians, New York Yankees and Atlanta Braves. After winning two World Series as a player and making six AL All-Star teams, the elder Chambliss served as a hitting coach for the Cardinals, Yankees, Mets, Reds and Mariners while also serving as a Triple-A Manager in the Mariners system in 2010. Walsh was the Athletic Trainer for the Gulf Coast League Cardinals at the spring training complex in Jupiter, FL last season. Richter was the S&C Coach for the Johnson City Cardinals in the Appalachian League last season. Both Walsh and Richter will be in their first year with the Chiefs. Season ticket packages and group tickets for the 2019 season are currently on sale by calling 309-680-4000. The 2019 season kicks off April 4 in Cedar Rapids, Iowa with the home opener against the Beloit Snappers set for Saturday, April 6 at 6:35 p.m. Individual game tickets will go on sale Friday, March 1 at 10:00 a.m. Fans can keep up with all Chiefs news during the offseason online at www.peoriachiefs.com and on twitter or instagram: @PeoriaChiefs.